School feeding not only nurtures children and improve their health, but they are also key in facilitating access to education as they increase school enrolment, attendance and completion. On 9 March 2017, International School Meals Day was celebrated around the world as a timely reminder of the need to promote good nutrition and healthy eating habits for all children regardless of their circumstances. Every day around 370 million children around the world are fed at school through school meals programmes that are run in varying degrees by national governments. Since its launch in 2013, it has brought together teachers and students, policy makers, school cooks, chefs, food and nutrition professionals, schools and communities, charities, businesses and health professionals from around the world to talk about the importance of school meals and its impact on wellbeing and education. The day is managed by Children in Scotland. Each school meals programme is different: beans and rice in Madagascar, spicy lentils in the Philippines, vegetable pastries and fruit in Jordan. In some countries it may be a healthy snack, or it could include take-home food such as vitamin A-enriched oil for the whole family. Many governments are increasingly sourcing food from smallholder farmers in a bid to boost local agriculture, strengthen local food systems, and move people out of poverty. Known as Home Grown School Feeding (HGSF), the model augments the impact of regular school feeding programmes with economic benefits for local communities. However, designing and implementing a HGSF programme is a complex task. As investments in HGSF programmes increase, global partners are responding to the need for technical assistance in delivering effective, efficient and high-quality programmes. The World Food Programme (WFP), the WFP Centre of Excellence against Hunger (WFP CoE), the Food and Agriculture Organization of the United Nations (FAO), the International Fund for Agriculture Development (IFAD), the Global Child Nutrition Foundation (GCNF), the Partnership for Child Development (PCD) and the New Partnership for Africa’s Development (NEPAD) have joined forces to create a Resource Framework for the design, implementation and scale up of government-led HGSF programmes with funding support from the Government of Canada. 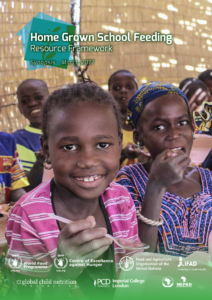 The Home-Grown School Feeding Resource Framework supports governments through the process of policy formulation, implementation and evaluation of school meals programmes. It also brings together the technical expertise of different stakeholders in a programmatic and coherent way to be easily accessed by countries requesting technical assistance.